Make ironing as pleasant as possible No more mixing starch with water or environmentallyunfriendly aerosol cans that get clogged. "Best Press The Clear Starch Alternative" is a clear and fragrant miracle starch that doesn't clog, flake, or leave a residue even on dark fabrics. Also relaxes stubborn wrinkles, makes ironing easier, and makes fabrics soilresistant. The clear, nonaerosol spray bottle lets you see how much is left. In Tea Rose Scent. 16.9 fl. oz. 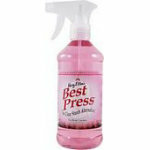 "Best Press" is a trademark of Mary Ellen Products, Inc.